Search Engine Optimization or Pay Per Click Ads? Which Matters More? Home » Our Blog » SEO vs PPC: Which Matters More? It’s no secret that both SEO and PPC generate traffic, but which deserves more of your time?? While both are beneficial, every business or website has different goals that are accomplishable through one or the other. This post breaks down SEO vs. PPC to get you the most bang for your buck (and your time). 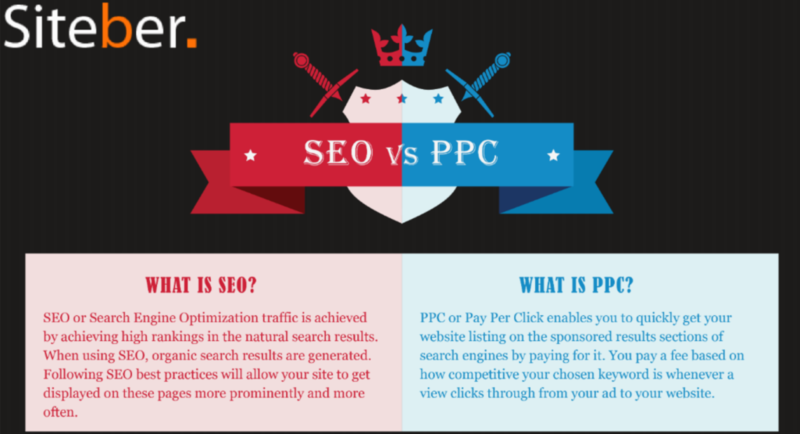 SEO vs PPC: Which Is More Important? There is no wrong, right, or direct answer to this question. Pay per click and search engine optimization generate different results. First, let’s take a peek at some stats for each in order to understand their differences. Nearly 80% of users ignore paid ads in SERPs. Organic search is considered more trustworthy—users know paid ads are paid for. 70% of clicked search results are organic. 51% of all website traffic comes from organic search, while only 10% comes from paid search. Over 40% of revenue is captured by organic traffic. The first organic search result on Google gets 32.5% of traffic share. PPC ads are one of the top three generators of on-page conversions. For every $1 spent on Google Adwords, businesses earn an average of $2. Paid search results gain 1.5 times as many conversions from click-throughs as organic search results. Pay per click visitors are 50% more likely to make a purchase than organic visitors. PPC statistics are easier to measure than SEO statistics, making it easier for marketers to track ROI and manage budgets. Both strategies get results, which makes it hard to choose. The key is understanding the biggest advantage of each. Search engine optimization has one obvious advantage—it comes at a low cost to anyone who wants to use it. On the other hand, it is a long term investment. SEO results take longer to develop than results of PPC. However, because SEO is so cost efficient and has powerful results, every business should start by optimizing their sites for search engines. Google Adwords is best for businesses trying to get a message across quickly. Pay per click ads have the ability to put you on the first page for a given search term within a day. PPC gets instant results: This is especially beneficial to new businesses and brands trying to increase awareness. Know your industry’s goals. Is your company looking to increase traffic? Promote a new product? Increase their brand awareness? Understanding your company’s aspirations will help decide whether to put your time into optimization or paid ads. SEO is always the way to go. Optimizing your site for Google is free, and if done well can bring superior traffic and ROI. Our advice is to make sure your optimization strategies are intact before putting your money into paid advertising. Pay per click gets fast results. If you’re looking for immediate results, pay per click is the strategy that will get you there. Moreover, the better your ads are optimized, the better your results. Use PPC and SEO together for even better results. Marketers who use a combination of organic search engine optimization techniques and PPC ads see an average of 25% more clicks and 27% more profit than those who only use a single technique (searchenginepeople). Are you unhappy with your return on investment? Everyone’s been there—and everyone knows that pay per click can be a handful to manage. Let the professionals at Digital Firefly Marketing handle all of your PPC needs and maximize your ROI. Contact us for a free pay per click audit.